The new issue of WS&S is currently at the printer. 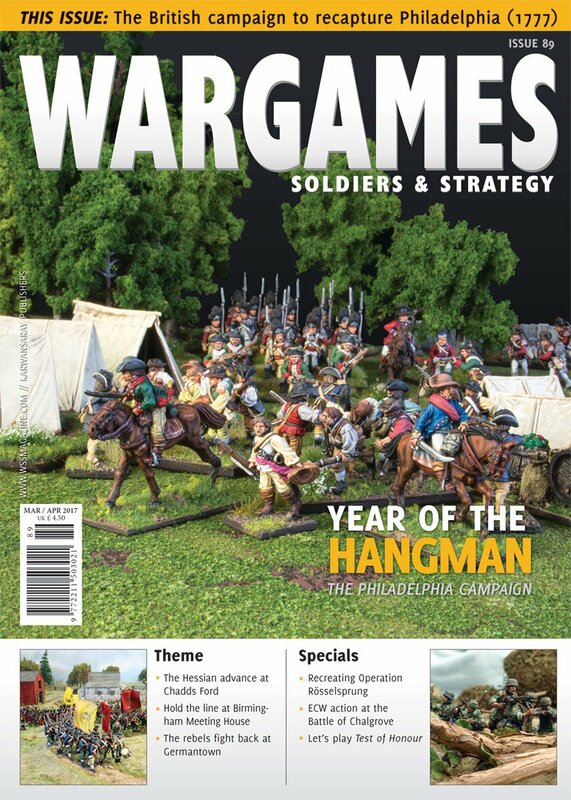 We've got several themes planned in 2017 that commemorate a historical anniversary, and this is the first one: we take a look back at 1777, 'The Year of the Hangman'. Our theme focuses on the Philadelphia Campaign during the American War of Independence. Steve Jones, author of the AWI supplement for Black Powder, gives us a series of battles for this pivotal year, including Birmingham Meetinghouse, Battle of the Clouds, and Germantown. We've got some pretty juicy off-topic articles as well, which include a scenario for the ECW battle of Chalgrove Field, and an extremely thorough look at how you can recreate Operation Rösselsprung (A German attempt to capture Tito during WWII). Column: Rick Priestley, "This gaming life: Mein host"
This month sees our miraculous return to print just when you thought our much-loved editor had got rid of me for good and it was once more safe to open your copy of Wargames, Soldiers & Strategy. Fear not though, it is not all bad news; I shall only be gracing alternate issues from now on, so you will have an extra two months to recover from any unwelcome shocks to the system that may result from an accidental perusal of these pages. Feature: Stuart Jordan, "Bitesize Battles goes medieval - The Battle of Rottingdean"
As you will all know, inspiration for new scenarios to try out can come from many different places. In this case, it came from a passage in England, Arise, Juliet Barker’s book about the 1381 Great Revolt. While exploring the background to the uprising, she describes a vast French and Castilian fleet raiding all along the south coast in the summer of 1377, at the height of the Hundred Years’ War. Towns from Plymouth to Folkestone and up the Thames Estuary as far as Gravesend were attacked. Feature: Dillon Browne, "The Battle of Chalgrove Field, 18 June 1643 - Death of 'The Patriot'"
The English Civil War was marked by many small battles throughout the country. I grew up in South Buckinghamshire – the nearest battle was Chalgrove Field where the Parliamentary leader John Hampden was mortally wounded. But as battles go you could hardly call it a fair fight. It was such a one-sided contest there was hardly any point to staging a refight – or so I thought. Feature: Daniel Bamford, "Knight's move - Checkmate Tito? - Operation Rösselsprung"
In February 1944, Marshal Josip Broz ‘Tito’, commander of the Yugoslav National Liberation Army, was forced to move his headquarters to the Bosnian logging village of Drvar, where he was soon tracked down by German radio intercepts. Hitler personally ordered the capture of Tito, dead or alive. The order was duly passed down to Lieutenant-General Ernst von Leyser’s XV (Mountain) Army Corps, but the actual capture of Tito would be attempted by a rather curious Waffen SS paratrooper unit. Feature: Richard Evers, "The beginning of the First Samnite War - The Saticula Ambush"
It was the first year of what would later would become the First Samnite War (343– 341 BC). Rome was the emerging power in central Italy, disputing with the existing Etruscan and Samnite nations. Rome was getting more aggressive every year and allying with every nation that asked for help, like the Campanians had done a few months earlier. The Samnite wars were about to start; they would last until 290 BC. Tabletop tactics: Henry Hyde, "Tabletop tactics - To harry and harass"
Peltasts and psiloi. That, my friends, means light infantry to you and me. If you’re an Ancients gamer, then you know that already (or, at least, I hope you do). So, what’s the difference? Peltasts throw things. They traditionally threw javelins. Their name comes from the peltè, the crescent-shaped shield carried by the most famous type of light infantry in the ancient world, from Thrace. Theme: Steve Jones, "The 1777 campaign to seize Philadelphia - The Year of the Hangman"
The revolution against King George was in its third year. So far, the British had stumbled and fumbled their way through. The embarrassments of Concord, Bunker Hill and the siege of Boston had been followed by a failed amphibious assault on Charlestown and a much larger and more successful one at New York. Theme: Steve Jones, "An introduction to recreating the campaign - To Philadelphia and back again"
There are four scenarios presented (plus two online). These can be played individually and can easily be adapted to other horse and musket wars, so even if you aren’t an AWI player there is still plenty of wargaming content for you to get your teeth into. The scenarios can also be played sequentially as a campaign, with players accumulating points and each battle having the potential to affect the next. Theme: Steve Jones, "11th September, 1777 - Birmingham Meeting House"
While Knyphausen’s force demonstrated at Chadds Ford to occupy Washington’s attention, the larger portion of Howe’s army descended unexpectedly on the northern flank of the rebel army. Cornwallis’s wing contained the cream of the British and Hessian units, including the converged light and grenadier companies and the brigade of Foot Guards. These were supported by a couple of brigades of British regular infantry. Theme: Steve Jones, "16th September, 1777 - The Battle of the Clouds"
This is the ‘battle that almost was’. Following the dramatic events at the Brandywine Creek, Washington drew his army ten or so miles north towards the Schuylkill River, assuming defensive positions along the routes the Crown were likely to use. As before, the Main Army was now able to shield Philadelphia while retaining some room for manoeuvre. Theme: Steve Jones, "4th October, 1777 - Germantown"
Howe and Washington faced off across the Schuylkill River during the latter part of September, the stalemate being broken when the Crown feinted towards the town of Reading, drawing the rebel army in that direction, while the redcoats and their allies crossed the river closer to Philadelphia. The rebel capital fell to the Crown on the 26th of September, but most of Howe’s army encamped to the north of the city where they could protect it from Washington’s forces. Theme: Guy Bowers, "The troops of King George for the AWI"
The British Army of the American Revolution was a conglomeration of professional British Regiments, mercenaries from German principalities (a.k.a. the Hessians) and volunteer forces of Loyalists raised to serve King George. Against them stood a ragtag force of patriots who George Washington would fashion into a professional American army. With the help of the French and Spanish, they would defeat George III’s armies. Column: Jamie Gordon, "The Irregular - Wargaming on the Go"
The pertinent quote above is drawn from H.G. Wells’ final book Mind at the End of Its Tether and is as applicable to our hobby as it is to the enduring survival of humanity he was considering at the time. Hobby: Andres Amian, "Painting Antarean Algoryns - Strike Force Zeta Ta-Ri"
As I have mentioned on previous occasions, I prefer to look for fast and easy ways of painting my models and finishing whole projects (or trying to at least! ), rather than spending hours completing a very nice model and then just giving up on a project after realising I won’t finish it at that pace. So, yes, I have to sacrifice detail in favour of saving time, but I always try to get a nice and satisfactory final result. Hobby: Stephen Tunmore, "How to make realistic hills - Rolling countryside"
If you look at the countryside as you drive along, you will see rolling hills and undulating fields that merge into each other. This is the kind of scenery that you very rarely see on a wargames table. Here is a tutorial to show you how this can be done. Hobby: Tony Harwood, "Building a Romano-British Shrine"
This scratch-built model was inspired by an artist’s impression of a Romano-British shrine from Godmanchester (Huntington, near Peterborough). I was intrigued by the structure as I had never seen anything quite like it in any historical record. I particularly liked the ornate (and not very Roman) wooden arched frame with the tegula and imbrex tiled roof (a two part tiling technique using flat tiles as a base and curved or inverted ‘V’ tiles over the joins), something that I had never successfully modelled. Let's play: Guy Bowers, "Samurai movie-inspired skirmishes - Let's play Test of Honour"
I am an unabashed fan of Samurai movies. You name it – Hidden Fortress, 13 Assassins, Harakiri, Zatoichi – there’s a good chance I’ve seen it (or the different versions in the latter two). So when I heard that Warlord Games were doing a Samurai game inspired by Chanbara (Japanese for sword fighting movies), I wanted to try a piece of the action. Reviews: Chris Payne, Mark Backhouse, Raif Watkins, Guy Bowers, and Eoghan Kelly, "Game Reviews"
In this extra-long edition of game reviews, our staff writers take a look at Dawns and Departures, SAGA: Aetius and Arthur, King of War Historical, Strike on Kar’A Nine, Swordpoint Dark Age Armies, and Arkeo Obskura.